My principal Buddhist teacher, Thich Nhat Hanh, says that in the Vietnam of his youth, every village had a Buddhist temple, and at random times throughout the day one of the monks would ring the bell of mindfulness at the temple, and the sound would resonate out into the fields. At the sound of the bell, all business would stop. The villagers would stop farming or cooking or teaching or whatever they were doing, and they’d breathe and smile and listen to the bell, as we just did. What a nice practice! 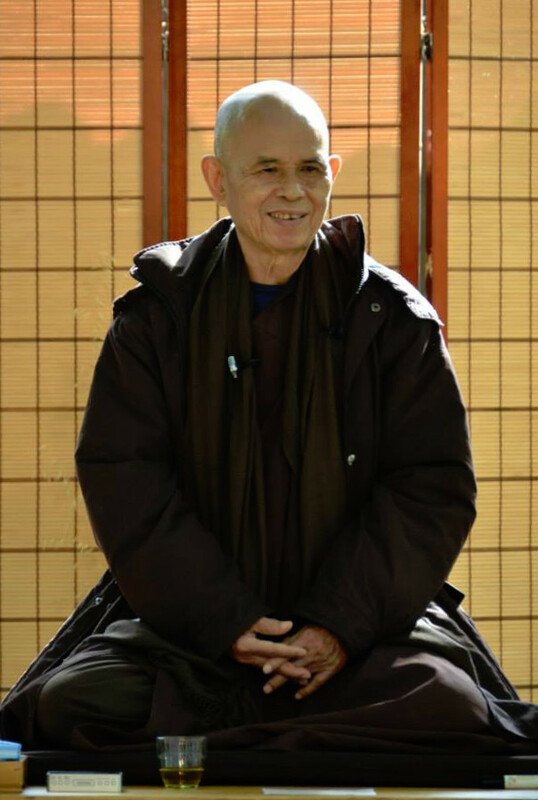 The first time I heard Thich Nhat Hanh speak, in the mid 1980s, he spoke about the bell of mindfulness and how seldom in our modern western society we simply stop what we’re doing and take a moment out. And he made some suggestions about how we could practice stopping, breathing and smiling. Thich Nhat Hanh understood that at first the person on the other end of the phone would be annoyed that it was taking so long for you to answer, but then he suggested what would happen as the person got used to it. On the first ring, your friend would say to himself: “Now he saying…” And your caller would smile and understand. Nhat Hanh suggested other things, like using the red traffic light as a bell of mindfulness, and at one time you could download a program from the Washington Mindfulness Community website that would ring a virtual bell of mindfulness at random times on your computer – perfect for office workers. When I was consulting at Mobil, I started using the Lotus Notes incoming mail chime as my bell of mindfulness. I hope you got a taste of how easy and pleasant that can be. And it’s not hard to imagine how we could transform some of life’s minor annoyances into the bell of mindfulness and accept with a smile the ringing of the phone, the red traffic light, the incoming email. Buddhism teaches acceptance. That doesn’t mean that we give up any desire to change things for the better. We can always decide to go live in a monastery in the woods to get away from phones, red lights and email, but those things are a reality for most of us. If we don’t accept them, we make our own lives more stressful. In meditating, many people find the sound of a barking dog or a crying baby or the screech of brakes to be an annoyance – an interruption. There’s a Zen story about a monk finding the noise from a waterfall to be a distraction until he realizes that the Buddha is in those rushing waters. The same can be said for phones, babies, computers and car brakes. When I led a weekly Buddhist meditation group at the Reston UU church, I would sometimes do a noise mediation. I’d use unpleasant as well as pleasant noisemakers to help people incorporate all sorts of sounds into their meditation. Embracing them rather than struggling against them. I’d suggest that you can’t overcome your bias until you accept it in yourself. Those celebrities instead might have been saying to themselves: “I have my biases and I accept them. I’m probably not going to totally exorcise my prejudice, but I want to learn how to overcome it.” They might not then have exploded the way they did. It’s hard, of course, to accept the unacceptable – to accept it in ourselves or others. I saw that in my family when my cousin Barry, a paranoid schizophrenic, shot his parents to death – my uncle and aunt, my mother’s brother and sister-in-law. I was at the crime scene the day after the bodies were discovered, and the police answered my questions, so I knew that the only reasonable conclusion was that Barry had done it, and I tried to prepare my mother for that outcome. But Barry remained with us for four more days before he was arrested and confessed, and my mother simply didn’t hear what I was trying to tell her. Even after the arrest and confession, my mother and other relatives would try to make any other explanation work. Barry had an Indian guru who was trying to help him overcome alcohol and drug abuse, so many in my family wove conspiracy theories involving the guru – anything but simply accept that Barry was so sick that he had killed his parents. It seems to be in our nature, when faced with the unthinkable, to build conspiracy theories involving clandestine evil-doers rather than accepting that sick or confused individuals acted on their own. So what happened on September 11, 2001? Osama Bin Laden and al-Qaeda sent some religious zealots here to create a disaster. That’s one perspective. Another is that our current president ignored warnings and put us at risk because of his connections to Arab oil money. Another is that our former president was busy seducing interns and guarding himself against legal actions and didn’t pay enough attention to al-Qaeda. There may be some truth to one or more of those descriptions, but how about this as a perspective? Nineteen young men all decided to die on the same day at approximately the same time and to take thousands of Americans with them. It’s hard to get your mind around that, isn’t it? I wonder where we would be as a nation if we were able to truly consider the desperation.